In July 1999, a newspaper in Singapore published a report about 5 kittens being burned alive in a box. Outraged by this and other senseless acts of cruelty towards innocent animals occurring in Singapore everyday, a few friends got together and decided to help other stray cats and kittens that live amongst us. This was how the Cat Welfare Society first began. We felt that having a Society would give us a more effective and stronger voice for the cats who have the right to be represented accurately and humanely, and the right to be free of pain, fear and suffering. Over the years, the Society has grown from strength to strength, amassing a very strong network of volunteers nationwide. Our work has expanded to include community mediation and frontline intervention, stray management, education outreach, rescue and rehoming, foster care programmes as well as adoption drives. When we first established in 1999, more than 13,000 cats were culled that year in a bid to control the stray population. That equated to an average of 35 cats killed every single day. Our tireless campaigning over the years against the inhumane culling of cats has resulted in a record low of less than 1000 cats put down in 2015. Whilst still not ideal, we have come a long way from where we started thanks to our dedicated volunteers who are actively working towards a common cause – savings lives everyday. 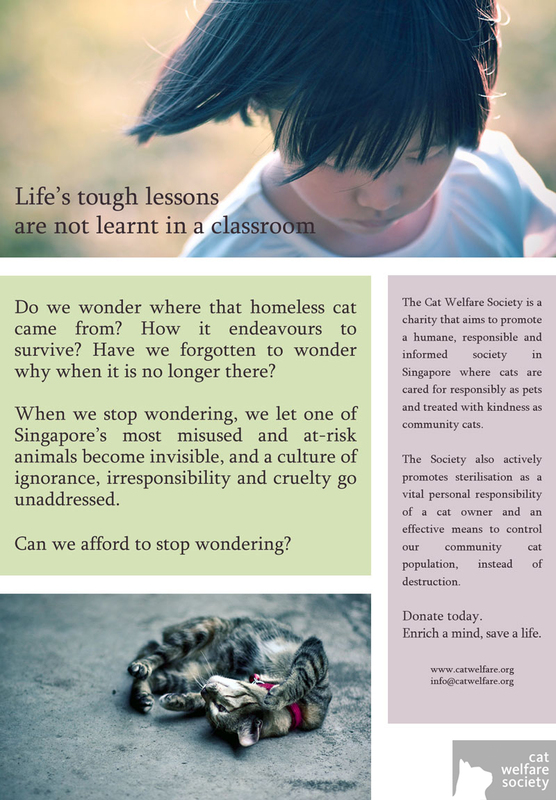 The Cat Welfare Society was officially approved and registered as a society on 23 October 1999. We were registered as a charity in June 2004 (UEN: S99SS0144E). We started with a vision – that all cats are cared for as pet cats or treated with kindness as community cats, free from fear and suffering. 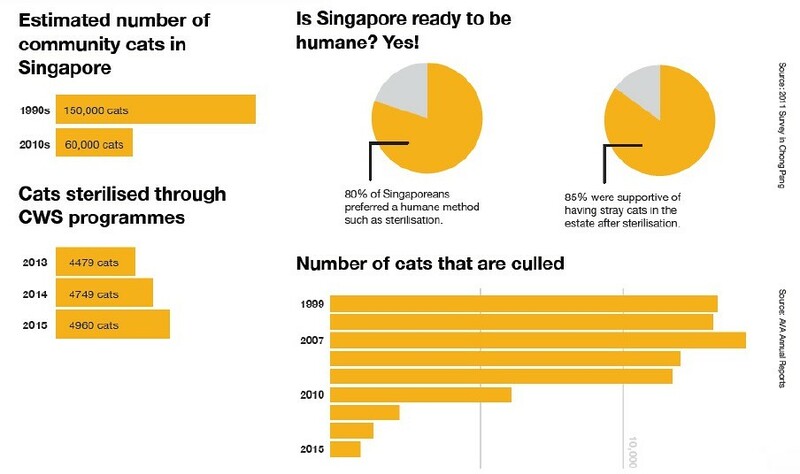 We focused intensely in the past 5 years on pushing through an islandwide stray cat sterilisation programme so that with less cats all around, they will receive the attention that they need. The burden on caregivers around the country to care for these cats will also be relieved. We focused intensely on community mediation, working alongside government partners to always choose a humane approach to community issues over an easy way out. The ripple effect from this has been falling culling rates, better public education and intervention efforts to help vulnerable humans and cats at risk. The work is far from done. We see our next focus to be on nationwide campaigns that shape the minds of Singaporeans, to promote responsible pet ownership and an understanding of the consequences of our actions on others. We want to foster a culture of understanding and create an empathetic society in Singapore that cares for each other, including animals. As we mature as a nation, we need to ensure that future generations can live harmoniously – that every man, woman, child and animal can live in peace together. A future where humanity reigns and kindness rules. This is the legacy we want to leave behind for generations to come.